Most people would probably agree that the obvious feature about time is that it progresses (or flows). However, our everyday experience of the apparent ‘dynamic’ nature of time conflicts with the basic laws of physics which do not posit any passage of time. This clash between experience and fundamental physics has led a few physicists to develop theories of the universe in which time’s passage is an explicit feature. Two such theories are discussed along with a possible non-‘dynamic’ alternative. Dr. Peter J. Riggs is a physicist and philosopher of science in the Department of Quantum Science at the Australian National University. The almost intractable nature of time has served to inspire (and frustrate) thinkers, poets, writers and artists for centuries. Indeed, the representation of time in art, poetry, and literature has an extensive and fascinating history. Many people will have seen (or otherwise be aware of) some of the graphic illustrations of time and its impact on human thought from the history of art. Consider, for example, the following illustrations showing two diverse perspectives towards time: Figure 1 is the mythical portrayal of a Serpent Biting Its Own Tail, which has been interpreted as a symbol of recurring time. 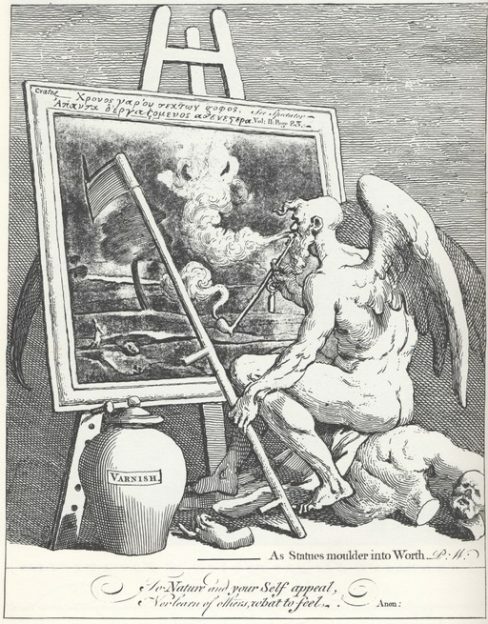 Figure 2 is William Hogarth’s Time Smoking a Picture, which is a pictorial personification of time. The depiction of time in various genres reflects the very deep influence that time has on our views about existence, aesthetics, reality, mind, free-will, mortality, religion, science, and human tragedy. In addition to time’s influence on human thought, there have been numerous perspectives on the nature of time itself. Aristotle (384–322 BC), for example, believed that time was inevitably entwined with motion (time being the numerical aspect of motion). 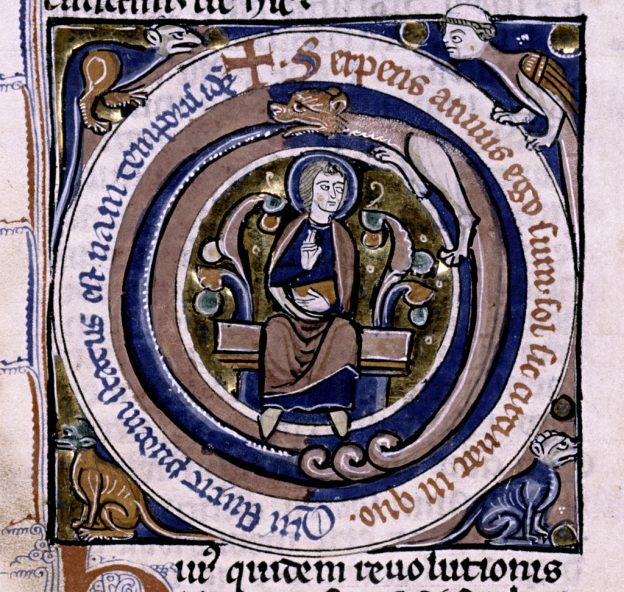 Saint Augustine (354–430) famously wrote that he knew what time is but if someone asked him to explain it, he would not know what to say. Sir Isaac Newton (1642–1727) declared that time was a physical absolute being the same everywhere. Immanuel Kant (1724–1804) thought that time was mind dependent. Bertrand Russell (1872–1970) contended that the passage of time did not exist. Albert Einstein (1879–1955) showed that although time was relative to individual observers (or rather to their frames of reference), time and space together form the ‘fabric’ of the physical universe. The brilliant logician Kurt Gödel (1906–1978) argued that time is not part of reality. In spite of the amount of attention, passion, and analysis directed to investigating aspects of time throughout the ages, we still don’t know what time is! We only know some of time’s characteristics and what we do know comes principally from Einstein’s Relativity theories. It is no overstatement to claim that physics in the twentieth century has informed us more about the nature of time than has the previous two and a half thousand years of philosophical discourse. Nevertheless, there remain many unresolved issues about time. In human experience, time gives the impression of being ‘dynamic’ for there seems to be an unrelenting passage of time. The present moment ‘becomes’ past and the future bears an unreal essence. Moreover, the future appears ‘open’ in a sense that the past is not – it is as if the future is a ‘canvas’ on which nothing has yet been painted. Time also seems to have a direction as the natural world exhibits irreversible phenomena, i.e. most macroscopic natural processes occur only one way in time (towards the future). Such irreversible phenomena occur every day without exception for we always observe that coffee and milk (say) spontaneously mix but do not spontaneously un-mix. Many philosophers have taken the ‘dynamic’ and directed aspects of time to be intrinsic facts about the physical universe, known directly from conscious perception. 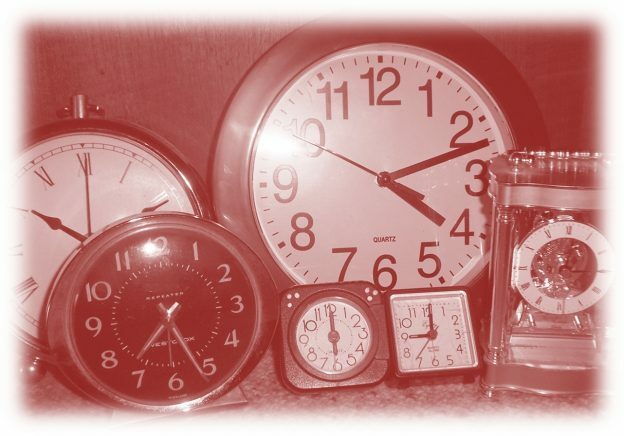 They argue that tenses (past, present, future) are objective distinctions which display essential properties of time and are not just convenient parts of linguistic communication. They believe, as does most of the population, that time passes or ‘flows’ with the end result that the past is different from the future. In other words, these philosophers claim that the tensed (‘dynamic’) view of time is correct. Most researchers in the physical sciences, on the other hand, have a matter-of-fact approach to time. They tend to accept the operational definition: time is what clocks measure, or more accurately, what it is that clocks measure is intervals of time (figure 3). 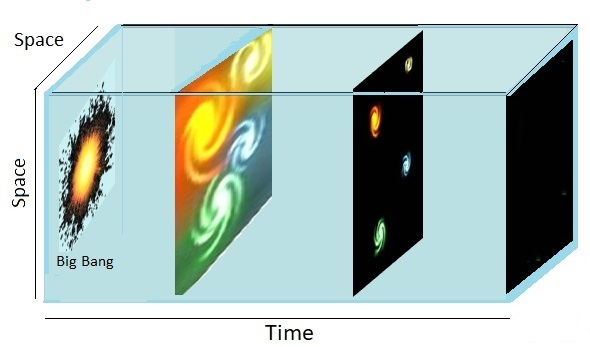 In contrast to common experience, time is not ‘dynamic’ from the point of view of physics but instead is one of four physical dimensions (the other three being of space) which together form a ‘container’ of events, also known as the Block Universe (figure 4). The basic laws of physics are explicitly formulated in terms of time and space variables (coordinates). Time has no passage (or ‘flow’) nor a direction in fundamental physics as basic physical laws are indifferent to time direction and do not have any terms which correspond to a passage of time. This is supported experimentally as there are no known instruments/devices that actually measure any passage of time (recall that clocks only measure time intervals). Further, these basic laws do not single out a particular time as the present moment. 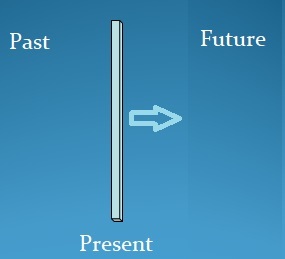 Tenses (past, present, future) are not absolute in physics either but instead are relative to one’s frame of reference. In sum, time does not have a unique present moment, is tenseless, is undirected, and is not ‘dynamic’ in physics. This is called the tenseless view of time which is embodied in the Block Universe. Our intuitions and everyday experience are completely at odds with what the basic laws of physics express for human consciousness is manifested in the present moment and steadfastly involves temporal passage with a definite direction (towards the future). The debate over what constitutes the correct view of time (i.e. tensed or tenseless) has been raging in academic circles for decades without a satisfactory resolution. The failure to reach a valid conclusion shows that the debate cannot be completely resolved by means of philosophical arguments alone but will require some empirical inputs. However, if we accept the tensed view of time as being correct (as seemingly provided by our perceptions) then physics cannot be complete in its description of the natural world in which we live. The clash between physics and everyday experience has prompted some philosophers to claim that physics simply fails to explain an essential feature of the universe. They argue that physics needs to fill the explanatory gap concerning time that conscious experience informs us about. If physics does have an explanatory gap, how might it be bridged? Discussions in the philosophy of time almost always include Relativity theory, or at least its revelations concerning time. The Special Theory of Relativity shows that there cannot be an absolute simultaneity between events. In other words, time is relative to the observer – what might be simultaneous events for one observer need not be simultaneous for another observer who is distant from or moving relative to the former observer. This denies the existence of an objective present moment (i.e. common for all observers) as such a present moment would be the time when simultaneous events occur. The lack of absolute simultaneity has led many philosophers to conclude that Special Relativity implies the tenseless view of time. Other philosophers think that the tenseless view is no more implied by Special Relativity than is the tensed view. Interestingly, not all physicists subscribe to the opinion that Relativity theory implies tenseless time leading them to construct theories of the universe in which the past differs from the future and there is an explicit passage of time. Let’s ponder two recent attempts by physicists that posit an objective, universe-wide present moment and passage of time, i.e. attempts that seek to fill the alleged explanatory gap in physics. First, we shall consider a theory due to veteran cosmologist George Ellis. He believes that current physics contradicts our everyday experiences and has proposed a theory called the Evolving Block Universe (which corresponds to the philosophical theory of time known by the names: Growing Block and Possibilism). The Evolving Block Universe is presented as being more in accord with daily experience than is the standard Block Universe, i.e. captures those features of the universe which our conscious experience indicates do exist. The past and the present moment are objective features of the Evolving Block Universe but not the future. The present moment is a movable boundary where events come into existence leading to an enlargement of the universe in both space and time. The enlargement in time is what constitutes time’s passage and gives time a direction – towards the (unactualized) future. The universe thereby evolves through a process of the ‘growth’ of new events which are being constantly created (figure 5). What about the ruling out of the absolute simultaneity between events by Special Relativity? Ellis argues that the existence of a universe-wide present moment does not violate the General Theory of Relativity when applied in the cosmological context. (The General Theory of Relativity is Einstein’s theory of gravity). In this case, Ellis maintains that the argument from Special Relativity simply is not applicable. He defines the present moment as an ever-changing ‘surface’ that separates future from past. This ‘surface’ is specified by a family of fundamental trajectories which start at the Big Bang (the beginning of space and time) and these trajectories are defined by the average motion of matter in the universe. In light of its features, Ellis argues that the Evolving Block Universe is the best model for explaining what objectively occurs with the physical universe and for our perceptions of time. A second contemporary theory is found in the writings of physicist Lee Smolin called Temporal Naturalism (which corresponds to the philosophical theory of time known as Presentism). Temporal Naturalism holds that a universe-wide present moment and the passage of time are objective features of the natural world. This theory differs crucially from the Evolving Block Universe in that only the present moment exists. In Temporal Naturalism, all that exists only exists now (in the present moment). An on-going succession of the present moment is what constitutes the passage of time (figure 6). However, Special Relativity’s prohibition on an absolute simultaneity between events crops up again. How does Smolin deal with it? In order to have an observer-independent, universe-wide present moment, Smolin utilises a reformulation of the General Theory of Relativity, called Shape Dynamics. This has a preferred global simultaneity, i.e. a type of simultaneity is accepted that can be applied over the whole universe. Shape Dynamics allows a global simultaneity by doing away with the relativity of time in favour of the relativity of size. In other words, size doesn’t matter much in Shape Dynamics! The same predictions are made by Shape Dynamics and General Relativity in most cases leaving open one way to empirically distinguish between them. Further, Smolin argues that the basic laws of physics evolve with time, rather than being eternally fixed. This requires that the Big Bang was not the beginning of space and time but the result of a previous universe contracting and then rebounding into the expanding state that we observe today. Such a prior universe might have left traces in the current universe which may be detectable in the cosmic microwave background radiation (i.e. the very low level of microwave radiation left over from the Big Bang that fills all of space). The two major theoretical ‘pillars’ of twentieth century physics are Quantum Mechanics and General Relativity. (Quantum Mechanics is the theory governing physical processes at atomic and smaller scales). The unification of General Relativity with Quantum Mechanics (called Quantum Gravity) has been a goal of theoretical physicists since at least the 1940’s and is still to be achieved. There are hopeful signs that this theoretical unification may occur in the next few decades. Quantum Gravity is relevant for it should provide some novel and significant insights into the nature of time. Quantum Gravity will also allow the formulation of a testable theory of quantum cosmology, i.e. an ‘over-arching’ theory applicable to the whole universe at all scales and at all times. Quantum cosmology will have important implications, e.g. about the Big Bang, for the models proposed by Ellis and Smolin. Sadly, what these implications are will have to await the arrival of the theory of Quantum Gravity! Can a Version of the Tenseless View Suffice? Many philosophers have strongly argued that there are serious conceptual and analytical difficulties with any ‘dynamic’ (tensed) view of time. These difficulties highlight the problem of admitting the passage of time as a genuine physical process and therefore suggest that time is tenseless. If we accept that time is tenseless then we have to reconcile an absence of the passage of time with our common experience which implores us so strongly towards the tensed view. The acceptance of tenseless time would require that our impression that time ‘passes’ is illusionary and to be explained with reference to psychology and human physiology. Such an explanation is not far-fetched for it is well known that the human perception of time depends on many psychological and physiological factors. 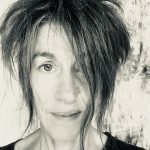 The biggest barrier to acceptance of the tenseless view of time has always been its inability to offer a satisfying explanation of why we appear to have the experience of time passing. Nevertheless, there are some recent accounts of tenseless time which offer to explain the impression of the passage of time in terms of psychological and physical causes. Let’s consider one such account. The current author has put forward a version of tenseless time in which the passage of time is not real but is an illusion generated by two physical perceptions, denoted as the primary and secondary perceptions of (apparent) passage. 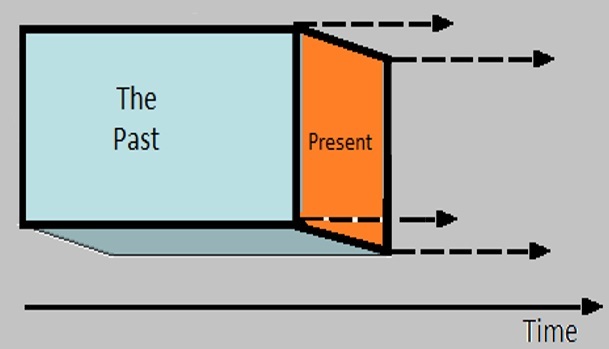 The secondary perception of (apparent) passage consists of being conscious of having lived through a given period of time and is the result of an awareness of both the time order of events and their duration. This perception depends on the normal functioning of human memory but cannot be the complete explanation as the experience of passage does not just result from accumulating memories but requires something more. The primary perception of (apparent) passage provides this additional contribution. It is the immediate and on-going feeling in the brain of time ‘passing’ unceasingly and is likely due to a physical anisotropy of time (see below). The combination of these two perceptions gives rise to our conscious experience that time seems to constantly pass and leads to the belief that time has a ‘dynamic’ nature. Even though the passage of time is illusionary in this account, these perceptions would have physical origins. The existence of two separate perceptions might be verifiable though the techniques of experimental psychology and is an intriguing possibility for future research into the human experience of time. This is one possible example of the empirical input (mentioned above) that will be required to advance the debate over what is the correct view of time. Is there a potential problem here with the basic laws of physics? Since the basic laws do not exhibit a temporal direction, physical processes are not necessitated to proceed in one temporal direction, contrary to what is experienced in everyday life. The primary perception of the (apparent) passage of time suggests that some form of physical anisotropy of time exists despite not being reflected in the basic laws of physics. Such an anisotropy of time is analogous to the grain in timber. When timber is cut or split, there is a strong tendency for going along with the grain. Similarly, this anisotropy of time would be manifested as a tendency for physical processes to develop along one direction of time without being ‘written’ in the basic laws. There is some empirical support for an anisotropy of time in the process called the Weak Nuclear decay that occurs with specific elementary particles. The current experimental data suggests that this process is not symmetrical in respect to time direction which indicates an anisotropy of time. More data from the relevant particle decays is needed to assist in investigating the possibility of any anisotropy of time. This is another example of empirical input which may inform the debate over the competing views of time. We have noted that the debate over what constitutes the correct view of time cannot be settled by philosophical arguments alone. Fortunately, the twenty-first century offers the possibility of resolving at least a few of the long-standing issues about time by scientific methods and/or by insights gained through an observationally verified theory of quantum cosmology. In addition, the expected developments in physics and cosmology concerning the nature of time should provide inspiration to the upcoming generation of artists, poets, and writers to create literature and artforms depicting newly discovered qualities of time. Whether either of the approaches to modifying existing physical theory that we have surveyed are victorious will be ultimately determined by their respective empirical success. If one of these approaches makes predictions that differ from current physical theory and are confirmed in multiple testing situations then this will lead to its acceptance. However, if these two approaches do not make experimentally confirmed predictions that differ from current theory then this will lead to their demise. In such a case, we would have the alternative of tenseless accounts of time to choose from — as the saying goes, “Time will tell!”.